John DeLorean’s career was on a roller coaster ride in 1968. His recent promotion to division head at Pontiac gave him the distinction of being the youngest department head ever at the company. His automotive brainchild was also entering its fifth year of production. In that short amount of time, the GTO had become a performance icon and the embodiment of cool. The GTO wasn’t just a car, it was a lifestyle. Just pick up any car magazine during this timeframe and the GTO was most likely featured in some way. Sales were still brisk and Pontiac sold almost 88,000 units in 1968 -- it’s second-best sales year ever. Even the competition was churning out copycats left and right. However, one thing is certain. There’s only one original and that was the Pontiac GTO. The GTO underwent a major transformation for the 1968 model year. Gone was the “Coke” bottle styling from the previous generation. It more closely resembled a fastback with rounder body contours and, for the first time, could be ordered with optional hidden headlamps. The GTO was now almost six inches shorter in length, a half-inch lower in height, and its wheelbase shrunk slightly. One of its most distinctive features was the new Endura nosepiece. This body-colored bumper was a type of plastic that was able to withstand a low speed blow without chipping or cracking. A TV ad depicting white-coated engineers hammering away at the bumper with a crowbar without any damage was used to get the word out about this innovative new feature. The 1968 GTO garnered numerous awards from several major magazines. It got a “10 Best Test Cars of 1968” nod from Car Life magazine and Motor Trend presented it their “Car of the Year” award. In fact, Pontiac was the only manufacturer to win Motor Trend’s prestigious award on four separate occasions. The big news in performance was the mid-year addition of the Ram Air II 400 V8. This engine package consisted of special round-port cylinder heads, a recalibrated Quadrajet carburetor, and lighter valves. An M21 four-speed manual transmission and 4.33 rear axle were also part of the engine package. It was conservatively rated at 366 horsepower. It was no slouch either. It was capable of going from 0 to 60 in 7.4 seconds and running the quarter mile in the low 14 second range. If you considered Pontiac’s 400 cubic-inch engines too “tame”, the folks over at Royal Pontiac were more than happy to build you a rip-snorting, 390 horsepower, 428 cubic-inch screamer. For $650, Royal would remove the stock engine and transform your GTO into a Royal Bobcat GTO. This engine came complete with blocked heat-riser passages, a Ram Air kit, and reworked valve springs. This go-fast transformation would get you a 0 to 60 time of 5.2 seconds and a quarter mile run of 13.8 seconds at 104 mph. The GTO was no stranger to controversy. One area of concern by the brass at the GM corporate office was Pontiac’s advertising campaigns that promoted unsafe or aggressive driving. One ad in particular created a firestorm of controversy with the suits. The ad depicted a driver in a GTO coupe stopped on the side of Woodward Avenue. Woodward Avenue was a street in Detroit that was known as a place used by the locals for street racing. The ad’s caption reads “The Great One by Pontiac. You know the rest of the story”. Shortly thereafter, the ad was shelved and a billboard in Detroit with the ad was taken down. The fun police may have won the battle but it wouldn’t be the last time Pontiac created ads that push the boundaries of safety and infuriated GM executives. The GTO received a bit of a nip and tuck for the 1969 model year. The grille and taillamps were slightly altered, vent windows from the doors were removed, and the rear quarter side markers now bore the shape of the GTO emblem. Inside, the ignition switch moved from the dashboard to the steering column and GTOs built after January 1 received integrated front seat headrests. Performance addicts were treated to a new engine choice this year. The Ram Air IV 400 was rated at 370 horsepower and 445 lb.-ft. of torque. Car Life put it to the test and got a 0 to 60 time of 6.2 seconds and ran the quarter mile in 14.45 seconds at 97.8 mph. The Judge was introduced this year as a low-budget alternative to the Plymouth Road Runner. For $337, the Judge package got you a 60-inch rear airfoil spoiler, black custom grille, functional hood scoops, and three-color slash stripes. The Judge issued street justice through either a 366-horsepower, 400 cubic-inch V8 or a 370-horsepower, 400 cubic-inch Ram Air IV. Noted automotive editor and writer Joe Oldham was one of the first in the automotive press to get his hands on a Judge prototype. In his book, “Muscle Car Confidential: Confessions of a Muscle Car Test Driver”, Oldham’s first reaction to the Judge was that it was “ugly and ridiculous” and lamented that he was going to be seen driving this monstrosity for the next 10 days. He also recalls taking the Judge to the streets of New York to gauge reaction from the GTO’s harshest critics — the buying public. After parking the Judge at a popular hot rodder hangout, Oldham states the car was swarmed with guys ogling over it and being extremely inquisitive about the Judge. He also mentions that while at a local White Castle one night, the car caused such a commotion that the manager ran him and the car off. Guess it was safe to say the verdict was unanimous. The Judge was a hit! 1970 saw more changes for the GTO. Gone were the hidden headlamps from previous model years. In their place were four round, exposed headlamps placed outside the grille. The rear bumper was also restyled and featured integrated taillamps. The base 400 cubic-inch V8 with 350 horsepower was carried over from last year. The optional Ram Air III and Ram Air IV engines were also still available. The big news this year was GM’s lifting of its earlier ban on placing engines larger than 400 cubic-inches in its intermediate lineup. Drivers could now opt for the new 455 V8 rated at a conservative 360 horsepower and 500 lb.-ft. of torque. It was capable of running from 0 to 60 in 5.6 seconds and sprinting the quarter mile in 15 seconds at 96.5 mph. The Judge also returned for 1970. Standard equipment included a rear-deck airfoil spoiler, front air dam, and blacked-out grille. Other standard features included special striping, “The Judge” emblems, and Rally II wheels. An interesting option for the Judge this year was the WT7 appearance package. This package was only available on cars painted in Polar White and included black eyebrow stripes, black hood scoops, and a black rear spoiler. 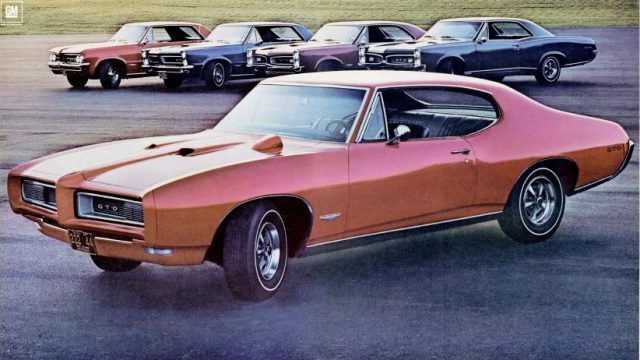 Once again, a GTO advertisement came under fire from GM’s upper management. This time around, the controversy surrounded a television commercial shown during the 1970 Super Bowl. The commercial highlights the Vacuum Operated Exhaust (VOE) option. This feature allowed the driver to open up baffles in the exhaust that reduced back pressure and increased performance when a knob under the dash was pulled. GM’s management saw the commercial and had the VOE pulled from the options list shortly after the commercial aired. This was due to increasing restrictions on emissions and noise levels being mandated by the federal government. They also did not allow the commercial to be shown ever again. Incidentally, only 230 GTOs left the factory with this rare option. The GTO entered 1971 with another refresh that included a new Endura front bumper, twin wire-mesh grilles, a new hood with long hood scoops, and restyled headlamps. Inside, drivers were treated to vinyl bucket seats, vinyl-blend carpeting, and engine-turned aluminum accents on the instrument panel. In anticipation of upcoming federal regulations regarding unleaded fuel, General Motors issued a corporate edict mandating that all 1971 models be able to run on low-lead or no-lead fuel. This lead to lower compression ratios in both the 400 V8 and the 455 V8 engines. Even with these drastic changes, Pontiac claimed that the performance of the 1971 400 V8 was as good as the 1970 400 V8. Pontiac also claimed the new 455 HO LS5 performed better than anything in Pontiac history. 1971 was also the year many automakers, including Pontiac, started advertising both gross and net horsepower numbers in their brochures and advertisements. What’s the difference? Gross horsepower is typically measured with the engine sitting on a stand without any accessories such as alternators, water pumps, or exhaust system. Net horsepower is measured at the flywheel on a dyno with all accessories, exhaust system, and smog controls installed. Motor Trend tested a GTO with the 455 H.O. and managed a 0 to 60 time of 6.1 seconds and a quarter mile run of 13.4 seconds at 102 mph. Halfway through the model year, the Judge option was cancelled. After a three-year run, the Judge laid down his gavel and rode off into the history books. With sales as high as 6,833 in 1969 and falling to 3,797 in 1970, Pontiac couldn’t justify building the car if the public wasn’t buying. Only 357 coupes and a mere 17 convertibles were built. Today, a 1971 Judge convertible can command a price in the quarter million-dollar range. Sales dipped tremendously compared to 1970. Only 10,532 GTOs were sold during the 1971 model year. No longer a separate model, the GTO was now an option package available for the LeMans and the LeMans sport coupe. Checking off RPO option code 334 got you a 400 cubic-inch engine, a three-speed manual transmission, and dual exhaust. This package also included an Endura front bumper, dual-scooped hood, and front fender air extractors. Buyers had several engine choices this year. A 400 cubic-inch V8 making 250 horsepower and 325 lb.-ft. of torque was standard. There were also two optional big blocks available. An L75 455 V8 with 250 horsepower and an LS5 455 H.O. with 300 horsepower. A rare option for 1972 was the ducktail spoiler. However, there’s speculation if any GTO’s had this feature installed since it’s been said the mold used to make the spoiler was broken the first day it was used. Some sources believe a few cars made it out of the factory before the mold was broken. Pontiac only sold 5,807 GTOs this year. That’s a far cry from 1966 when sales peaked at 97,000 units. With the government crackdown on emissions, coupled with rising insurance premiums on muscle cars, it’s a wonder the GTO lasted this long. 1972 is considered by many purists to be the last great GTO. The GTO would soldier on for another two years before getting the ax by Pontiac. A lot of changes were in store for Pontiac’s once fabled muscle car. Stay tuned for part three of our story coming soon!